There are different treatment methods for diabetic foot ulcers, like advanced moist wound dressing, , bioengineered tissue or skin substitutes, , growth factors, , electric stimulation,  low-potential laser therapy and negative pressure wound therapy (NPWT). The NPWT technique as a new emerging therapy for wound healing is a noninvasive system that functions by localised negative subatmospheric pressure. The mechanism of this therapy is delivery of continuous subatmospheric pressure, through a specified pump, which is connected to the resilient, foam-surfaced dressing that collects the wound exudates. , This technique is supported largely by various clinical evidences, case series, small cohort studies, randomised trials and multicentre randomised controlled trials. ,,, Therefore, we designed a randomised study to compare NPWT with standard care, moist wound dressing in patients with diabetic foot ulcers. We also compared satisfaction level of the patients and wound improvement between these two therapeutic methods. In the present study, 23 participants with diabetic foot ulcers were enrolled for moist dressing (13 patients) and vacuum-assisted closure (VAC) (10 patients) randomly (by simple randomisation method according to the date of admission). The NPWT system used in this study was VAC therapy. This system consisted of two components, a negative pressure-generating unit with a disposable canister and a pad with an evacuation tube. The vacuum-assisted closure of this system unit (manufactured by KCI Medical Ltd., England) is programmed to deliver controlled negative pressure up to 125 mmHg. Also, the suctioning and dressing were done simultaneously. In addition, the VAC dressing was administered within two weeks as the dressing was changed once every three days. Exclusion criteria were patients with renal failure if they were undergoing dialysis, had a history of poor compliance with medical treatments, were receiving radiation therapy or chemotherapy and had an ischemic ulcer that needed any open or endovascular revascularisation. The depth and size of the wound were inspected and recorded before and every three days during the study period. The moist dressing was performed twice daily after washing the ulcer with sterile serum and bandage. Type of diabetes mellitus and state of its control (in primary diagnosis, with control or without control), duration of the ulcer, previous history of treatment of the ulcer, wound location and frequency of underlying disease were evaluated for all the study patients. Depth of ulcers was measured by means of vernier caliper in the biggest vertical diameter of the ulcers and improvement of ulcer defined according to the Wagner scale. The protocol of the study was approved by the ethics committee of the Mashhad University of Medical Sciences. Informed consent was obtained from all patients before enrollment into the study. We considered satisfaction levels of the patients at the end of the studied procedures in the two groups. The final results were considered as major amputation (above-knee or below-knee amputation), minor amputation (less than below-knee amputation; toe or forefoot) and complete treatment. Data analysis was performed using SPSS version 11.5 (SPSS Inc., Chicago, Illinois, USA). Numerical data are expressed as mean ± standard deviation (SD) or percent as proportionate to the sample size. Comparison before and after the treatment were judged by paired t-test or parallel nonparametric test. Mann-Whitney test was performed to evaluate size of ulcer and depth of ulcer before and after the treatment in the two groups. A P value less than 0.05 was considered statistically significant. In the present study, 23 participants (15 males and 8 females) were allocated by simple randomisation method to two arms, VAC (7 males and 3 females) and moist dressing (8 males and 5 females) (P > 0.05). Demographic characteristics of our study participants are presented in [Table 1]. The male gender in both groups had the maximum frequencies. Osteomyelitis was diagnosed in 14 (58.33%) patients; nine (90%) and five (63.6%) in VAC and moist dressing, respectively. One patient (16.7%) in the VAC group and two (16.7%) in the moist dressing group suffered from malnutrition. Evaluation of localization of ulcers in the study participants showed that most of the ulcers were in the right forefoot, followed by the left hind foot and the right hind foot, respectively [Table 1]. Moreover, there was no significant statistical difference between the groups in the type of diabetes mellitus and its control (primary diagnosis, with control and without control) and duration of ulcer (months) (P = 0.43; P = 0.44; P = 0.13). History of ulcer treatment (medical, surgical, ordinary dressing and combination of these therapies) was significant in the study participants (P = 0.05). However, history of ulcer treatment in most of the patients in the VAC group was surgical therapies but it was medical and surgical therapies in the moist dressing group. Evaluation of the depth of ulcer before (17 ± 6 mm) and after (20 ± 8 mm) the moist dressing treatment was not statistically significant (P = 0.5), whereas this difference was significant for VAC dressing (P = 0.007; 19 ± 7 mm before vs. 12 ± 4 mm after treatment). The difference in the depth of ulcers in the VAC group versus moist dressing was significant (P = 0.02) [Figure 1]. Evaluation of the size of ulcer before (36.9 ± 10.4 cm 2) and after (54.2 ± 12.5 cm 2) the moist dressing treatment was not statistically significant (P = 0.1), although this difference was significant for VAC dressing (P = 0.02; 39.5 ± 9.1 cm2 before vs. 28.8 ± 8.5 cm 2 after treatment). The difference between the size of ulcers in the VAC group versus moist dressing was significant (P = 0.03) [Figure 2]. We performed the Wagner score for the study patients before and after the treatment [Table 2]. Mean analysis of the Wagner score showed that in both the study groups, this decreased, although this decrement was not significant in the moist dressing group. Evaluation of formation of granulation tissue showed that 70 and 50% of the study patients in the VAC and moist dressing groups, respectively, had formation of granulation tissue during the two weeks of treatment. There was a statistically significant difference between satisfaction levels of the two groups ( P = 0.004). 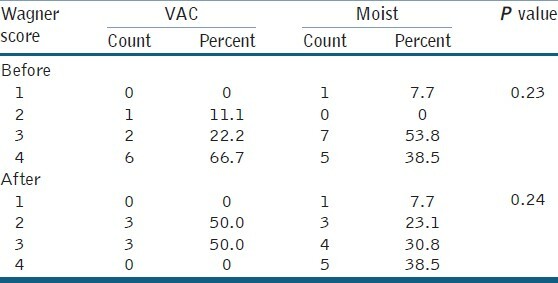 All of the study patients in the VAC group were satisfied with their therapy procedure and its result, whereas 10 (76.9%) patients in the moist dressing were not satisfied; only three (23.1%) of them were. Due to the consideration of major and minor amputation as final results of the present intervention, significant difference was seen between the two groups (P = 0.03). No patient in the VAC group underwent major or minor amputation and seven patients (70%) were cured completely. Among the patients in the moist dressing group, five (38.5%) and one (7.69%) individuals underwent major and minor amputation, respectively, and only four patients (30.76%) had complete healing. This study endeavoured to compare VAC dressing and moist dressing for regeneration of tissue and improvement of diabetic foot ulcer. 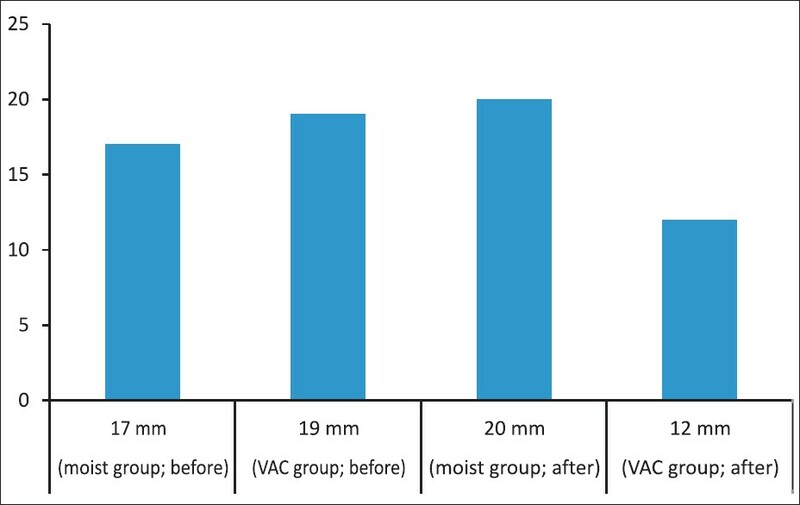 Our study showed that the size, depth and Wagner class in VAC dressing were reduced significantly compared to moist dressing. About 70 and 50% of VAC and moist dressing groups had granulation tissue, respectively. One study evaluated the NPWT after diabetic foot amputation in two VAC groups versus a moist dressing group. They changed the VAC dressing every two days and then, daily for 112 days. They found that 56 and 39% of VAC and moist dressing groups, respectively, had complete regeneration and granulation tissue was formed earlier in the VAC group. Furthermore, Mc Callon, et al. found that VAC therapy and moist dressing had a mean time of 22.8 and 42.8 days, respectively, for therapy. Besides, in the VAC group, the mean of changes in the size of ulcers was three weeks lesser than the moist dressing group (28.4% decreased vs. 9.5% increased). Although in the present study we did not evaluate complete regeneration, formation of granular tissue had obtained similar results. Eginton, et al. evaluated VAC and moist dressing in a prospective randomised study for four weeks, replacing the contrast treatment after two weeks. Another multicentre cohort study evaluated 342 patients with diabetic foot ulcers in two study groups (VAC vs. moist dressing) for 112 days and complete ulcer healing with a follow up of three to nine months. 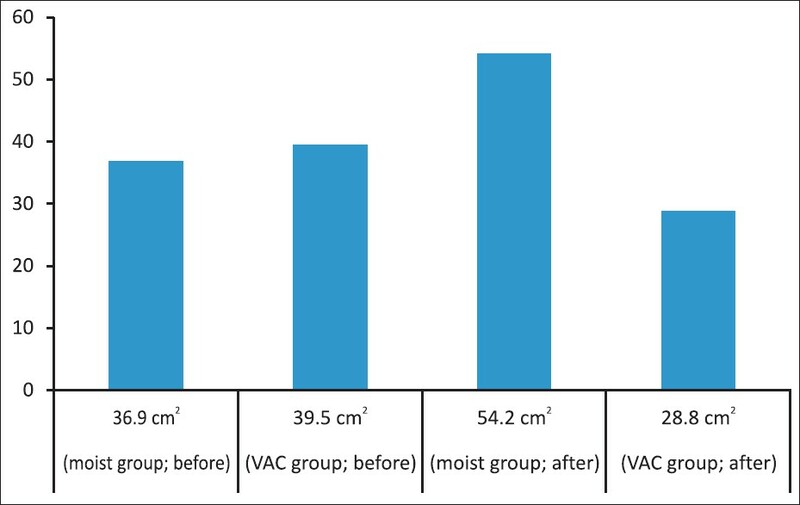 They found that most of the VAC (43.2%) group, in contrast to the moist dressing group (28.9%), improved during the 112-day therapy and experienced lower rate of further amputations. Moreover, evaluation of the complications like cellulitis and osteomyelitis showed that there were no considerable differences between the two study groups. Our study results about the efficacies of VAC in the formation of granulation tissue was confirmed by Armstrong, et al. on 31 diabetes patients. In their study, almost 90% of the ulcers improved with initial therapy and the mean of VAC therapeutic performance was 8.1 ± 5.5 weeks in most of the cases with rare complications. Twenty-two patients with 23 foot ulcers with VAC therapy were compared with 25 individuals with standard therapy. The VAC therapy reduced the need for hospitalization and duration of stay due to the possibility of following outpatient treatment. We did not assess the duration of hospital stay but we experienced fewer complications and good level of satisfaction in the VAC group without any amputation as compared to the moist dressing group. Although the number of patients in this study was limited, the results obtained from this study and satisfaction of the patients allowed us to conclude that VAC is a suitable treatment modality in the management of diabetic foot ulcers. 1. Ramsey SD, Newton K, Blough D, McCulloch DK, Sandhu N, Reiber GE, et al. 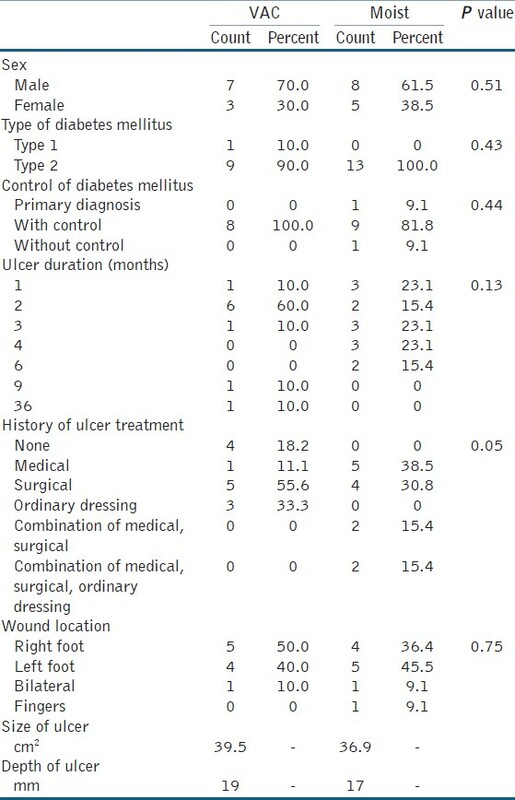 Incidence, outcomes, and cost of foot ulcers in patients with diabetes. Diabetes Care 1999;22:382-7. 2. Singh N, Armstrong DG, Lipsky BA. Preventing foot ulcers in patients with diabetes. JAMA 2005;293:217-28. 3. Brem H, Shehan P, Rosenberg HJ, Schnieder JS, Boulton AJ. Evidence-based protocol for diabetic foot ulcers. Plast Reconstr Surg 2006;117:193S-209. 4. Boulton AJ, Vileikyte L. The diabetic foot: The scope of the problem. J Fam Pract 2000;49 (11 Suppl):S3-8. 5. Lavery LA, Armstrong DG, Wunderlich RP, Boulton AJ, Tredwell JL. Diabetic foot syndrome: Evaluating the prevalence and incidence of foot pathology in Mexican Americans and non-hispanic whites from a diabetes disease management cohort. Diabetes Care 2003;26:1435-8. 6. Mulder G, Armstrong D, Seaman S. Standard, appropriate, and advanced care and medical-legal considerations: Part one-diabetic foot ulcerations. Wounds 2003;15:92-106. 7. Guideline for Management of Wounds in Patients with Lower-Extremity Arterial Disease. Glenview, IL: Wound Ostomy and Continence Nurses Society; 2002. 8. Martson WA, Hanft J, Norwood P, Pollak R. The efficacy and safety of dermagraft in improving the healing of chronic diabetic foot ulcers: Results of prospective randomized trial. Diabetes Care 2003;26:1701-5. 9. Veves A, Falanga V, Armstrong DA, Sabolinski ML. Graftskin, a human skin equivalent, is effective in the management of noninfected neuropathic diabetic foot ulcers: A prospective randomized multicenter clinical trial. Diabetes Care 2001;24:2001-295. 10. Robson MC, Payne WG, Garner WL, Biundo J, Giacalone VF, Cooper DM, et al. Integrating the results of phase IV (postmarketing) clinical trial with four previous trials reinforces the position that regranex (becaplermin) gel 0.01% is an effective adjunct to the treatment of diabetic foot ulcers. J Appl Res 2005;5:35-45. 11. Mannari RJ, Payne WG, Ochs DE, Walusimbi M, Blue M, Robson MC. Successful treatment of recalcitrant, diabetic heel ulcers with topical becaplermin (rhPDGF-BB) gel. Wounds 2002;14:116-21. 12. Peters EJ, Lavery LA, Armstrong DG, Fleischli JG. Electric stimulation as an adjunct to heal diabetic foot ulcers: A randomized clinical trial. Arch Phys Med Rehabil 2001;82:721-5. 13. Mouës CM, van den Bemd GJ, Heule F, Hovius SE. Comparing conventional gauze therapy to vacuum-assisted closure wound therapy: A prospective randomised trial. J Plast Reconstr Aesthet Surg 2007;60:672-81. 14. Wanner MB, Schwarzl F, Strub B, Zaech GA, Pierer G. Vacuum-assisted wound closure for cheaper and more comfortable healing of pressure sores: A prospective study. Scand J Plast Reconstr Surg Hand Surg 2003;37:28-33. 15. Armstrong DG, Lavery LA. Negative pressure wound therapy after partial diabetic foot amputation: A multicentre, randomised controlled trial. Lancet 2005;366:1704-10. 16. Mc Callon SK, Knight CA, Valiulus JP, Cunningham MW, McCulloch JM, Farinas LP. Vacuum-assisted closure versus saline-moistened gauze in the healing of postoperative diabetic foot wounds. Ostomy Wound Manage 2000;46:28-32,34. 17. Eginton MT, Brown KR, Seabrook GR, Towne JB, Cambria RA. A prospective randomized evaluation of negative-pressure wound dressings for diabetic foot wounds. Ann Vasc Surg 2003;17:645-9. 18. Blume PA, Walters J, Payne W, Ayala J, Lantis J, Blume PA, et al. Comparison of negative pressure wound therapy using vacuum-assisted closure with advanced moist wound therapy in the treatment of diabetic foot ulcers: A multicenter randomized controlled trial. Diabetes Care 2008;31:631-6. 19. Armstrong DG, Lavery LA, Abu-Rumman P, Espensen EH, Vazquez JR, Nixon BP, et al. Outcomes of subatmospheric pressure dressing therapy on wounds of the diabetic foot. Ostomy Wound Manage 2002;48:64-8. 20. Page JC, Newswander B, Schwenke DC, Hansen M, Ferguson J. Retrospective analysis of negative pressure wound therapy in open foot wounds with significant soft tissue defects. Adv Skin Wound Care 2004;17:354-64.